The Ultimate Lindy Hop Showdown in New Orleans is one of those epic dance events that I have somehow never managed to attend. 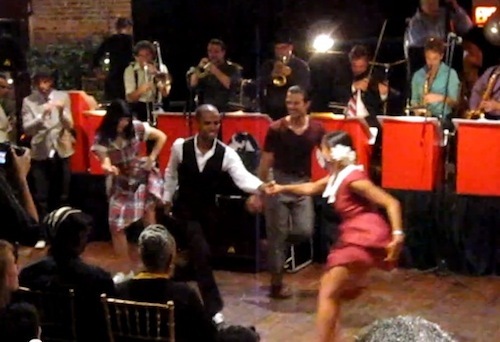 Everyone I know who has attended tells me that it hosts the most blazingly awesome lindy hop dancing you will ever see, plus social dancing all over this greatest of jazz cities. So I'm sorta dying that I can be at ULHS this weekend. I am somewhat consoled by that fact that Nola.com is again video simulcasting a lot of the competitions to the web on Saturday evening, starting at 8pm CST. There will be live music provided by "The Showdown All Star Band" featuring Meschiya Lake and some of my favorite contests: "Showcase," "The Showdown," solo Charleston, and the Jack 'n' Jill. Head here for more info from Nola.com or head straight to the video simulcast at this link.